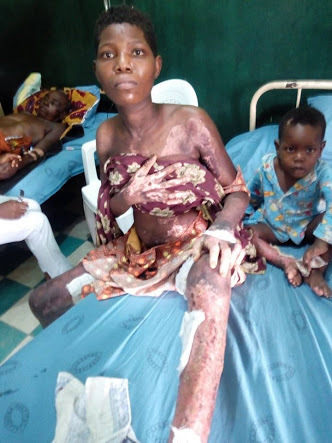 A young woman and her little son are lucky to be alive after being victims of fire mishap at their house in Delta state. A lady identified as Teshoma Afonughe revealed that the fire tragedy occurred after she put a gallon with kerosene near her stove and wanted to light it on with matches. The jerrycan with kerosene was said to have caught fire and exploded. The woman was badly burnt along with her new baby and her little son. The baby was reported to have died from burn injuries as she and her son where rushed to the hospital where they are currently being treated.